In a very old building within the grounds of a high school, there exists a club shrouded in obscurity. 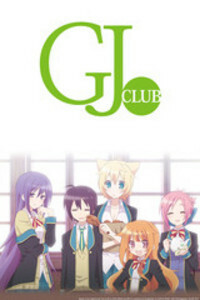 Kyoya Shinomiya is coerced into joining this club, known as GJ-bu (Good Job). Here he meets . . .
High school sophomore and president of GJ-bu. Strong-willed Mao is quick to lash out at Kyoya as soon as she feels unsatisfied about something. On the other hand, she is a very innocent girl who can’t even read mangas with kissing scenes. High school sophomore and undisputed genius. Mature beyond her years, Shion enjoys making fun of Kyoya. That said, she has absolutely no common sense and at times makes bizarre faux pas. Megumi is a very good natured girl, quite the opposite from her older sister Mao. With a heart that is generous like an angel’s, Megumi sees the good in everything. A strange high school sophomore who speaks very little and has a wild streak. Kirara always carries around meat and once in a while has conversations with animals. Nicknamed “Kyoro”, Kyoya is a high school freshman who also happens to be the main character of the story. Although laid-back and peace-loving by nature, during social settings Kyoya often fails to capture the essence of the situation. This leads him to make inappropriate remarks, causing him to be teased by the other club members. Based on the popular Japanese light novel, this anime series depicts the nonchalant interactions of Kyoya and the unique female characters in scenes you are sure to enjoy.